This week, to continue with my vanilla shots, I'm going to go with this lovely bruise. Ouch sweetie...that had to hurt. seriously - me too. I look like I get beaten, but it is by my own gracelessness - not sure how a former dancer can fall flat on nothing! Ouch! That looks like it hurt. Vanilla huh? Is that a tease that there's some non-vanilla shots coming? Ohhh owie! I hope that you heal fast! 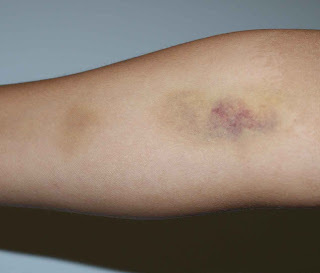 Ugh...(((you))) I bruise so easily too! that looks and sounds like it hurt! that looks kinda painful mommy. I am thankful you are ok otherwise! Are You Sure He's Potty Trained?